Million Dollar Voir la cabine sur une Acre 1 mile de la ville. Chalet, 3 chambres, 2 salles de bain, (6 personnes). Cette cabine confortable se trouve sur une colline surplombant Grand Lake, Shadow Mountain Lake, et Mt. Baldy. Probablement la meilleure vue à Grand Lake. Plate-forme impressionnante, idéal pour boire de la bière et le barbecue. Un acre avec une fosse de fer à cheval et grande fosse de feu avec des bancs en bois. L'intérieur de la cabine a été rénové. nouvelle cuisine, moquette, parquet, plafond en bois et foyer au gaz. 3 chambres à coucher, 2 salles de bain. Un mile de golf et le tennis. Accès Internet. La vue est fantastique! 230 $ par nuit, 3 nuits minimum requis. Séjour de vacances de 250 $ par nuit, 5 nuits minimum. Frais de nettoyage de 100 $. Mots-clés: vue fantastique de Grand Lake, Shadow Mountain Lake, et la ville de Grand Lake. Feu de camp avec des bancs et bois coupé, fers à cheval sur la propriété. Accès Internet. Cabine rénovée, 1200 pc, grande terrasse avec barbecue à gaz et à charbon. Beaucoup de fournitures fournies. Les deux salles de bains fournies avec des ensembles de serviettes. Les produits de papier comprennent le kleenex, le papier toilette. Shampooing / revitalisant. Sèche-cheveux et fer à repasser. The view of the lake from the cabin is priceless!! The cabin is clean and well kept. Animals every day; hummingbirds, chipmunks that eat out of your hand, and deer that come through the yard either at dawn or dusk. The town is close proximity within 3-5 minutes yet, the cabin feels secluded in the woods. Peaceful and beautiful view of the lake and the mountains! We spent every evening on the deck relaxing. Thank you to the owners for sharing your property. It is truly a gem! Lots of wildlife and great view! This is a perfectly appointed cabin with a great view of the lake and mountains. We found everything we needed at the cabin including spices and condiments which is very appreciated. The sheets and towels are high quality and super soft. The swing was a big hit with our kids, but they were sad that the tree house was out of commission. The kids enjoyed feeding Chippy and family, and we saw deer in the yard almost every day. 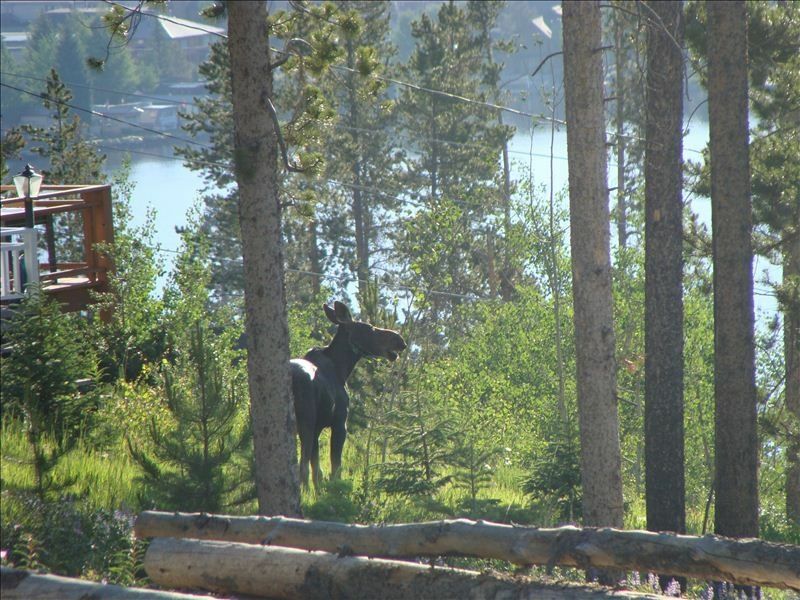 We also saw a moose in the neighbor’s yard as we were driving by and were able to get some great pictures of him. The town of Grand Lake is so cozy and charming, and we enjoyed several restaurants there. We thoroughly enjoyed our stay and look forward to returning someday soon! My husband and I stayed here for a week with our three daughters. The cabin was stocked better than any other that we have stayed in. The kitchen was well stocked with all the cookware and utensils that we needed to cook in every night. There were plenty of towels, wash clothes, pillows, blankets and extra jackets for those cool nights. There was even a generous supply of toiletries in case you forgot anything at home. The view of the lake and mountains were amazing from the deck. There was no better place to watch the sunrise or sunset and plenty of seating. We also enjoyed that it was minutes from down town Grand Lake and the RMNP entrance. Our local relatives were so impressed with the cabin that they asked for the VRBO ID so they could recommend it to other family members when they plan trips to visit. We will definitely try to book this property again when visiting Grand Lake. Stayed here with my family and we all loved it! Much less crowded side of RMNP. We saw more wildlife at the cabin then we in RMNP complete with moose, deer, and elk. Beautiful view. About a mile from town, we walked. Had everything we needed for a great stay. L'eau des lacs est glacée même en été, il faut des combinaisons de ski ou de tubing. Les VTT peuvent être loués et Grand Lake possède le plus grand nombre de sentiers dans l’État.